Ani Villas - Larimar is ideal for any group of travelers who wants the full luxury experience. There’s a beautiful, sea-facing pool. The villa has a private sandy area, a full staff, and six absolutely stunning Master Suites. Four of those suites are in their own chalet, and two are in the Main House with the remaining two guest bedrooms. Fully staffed and serviced estate with dramatic views!! Ani Villas - Larimar is a spacious, luxurious, 8-bedroom property perched on a private peninsula near Playa Caleton. 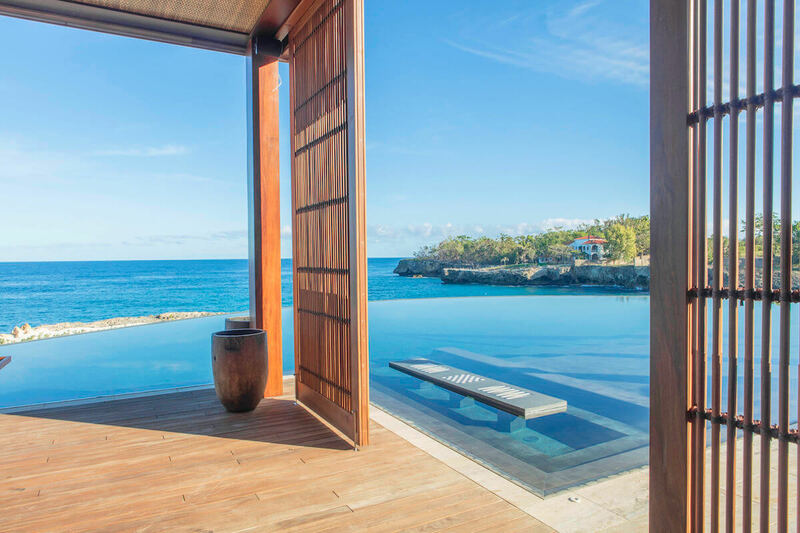 The villa enjoys wraparound views of the Dominican Republic’s sea, sand, and mountains. Larimar faces the sea and offers a private sandy beach area where guests can sunbathe or build sandcastles. There’s an infinity pool to swim in, with an in-pool dining area so guests can enjoy a drink as the sun sets over the horizon. For a workout, guests can check out the resort’s tennis court and gym and afterwards visit the spa for a daily treatment. For even more pampering, the villa’s 24-hour butler and personal chef will take care of every need. Larimar combines sliding glass doors and cathedral ceilings into an open-air pavilion that holds the living and dining spaces. Guests can find entertainment around every corner, from the billiards table, to the wet bar, to the media room. Villa Larimar has two king/twin suites, two Master Suites, and four independent Master Suites. One Master Suite is on the upper level, and the other is downstairs with the two king/twin suites. All of the bedrooms have ensuite bathoroms and access to the terrace or balcony. The four independent Master Suites offer guests privacy, a terrace, Apple TV with Netflix, and an ensuite bathroom with an outdoor shower and large soaking tub. They’re designed with pitched ceilings and decorated with artwork displayed on onyx slabs. Ani Villas - Larimar is located in a rural region that’s a short walk or drive from the island’s gorgeous beaches, top-notch surfing/kite surfing, and Trent Jones clifftop golf course. This villa is ideal for a wedding, family reunion, or corporate retreat.